Cross-border gangs play a unique role in the illicit transfer of people and goods across the southwest border. According to law enforcement reporting. Mexican cartels utilize US gangs to smuggle drugs and illegal aliens northbound. and smuggle cash. stolen automobiles. and weapons southbound. US gangs often freelance their work and seek profit-making opportunities with multiple cartels. Humming bird and Marilyn Monroe tattoos may have a nexus to the Mexican Mafia, while “G Shields” (Aztec warrior shields) and mariposas (butterflies) may be decreasing in popularity. As certain tattoos sported by Mexican Mafia members and supporters become mainstream, and because California Department of Corrections is known to use certain tattoos as validation points, Mexican Mafia members may introduce new tattoos to make it difficult for law enforcement and correctional officers to identify membership or affiliation with the group. Tattoos are also increasingly disguised within other tattoos, which can make them more difficult to easily identify. This handbook provides basic reference information on Mexico, including its geography, history, government, military forces, and communications and transportation networks. This information is intended to familiarize military personnel with local customs and area knowledge to assist them during their assignment to Mexico. 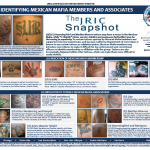 A document published on the website of the Mexican Instituto Nacional de Migración (National Institute of Migration) in July 2013 detailing Latino gang tattoos. The National Drug Intelligence Center (NDIC) assesses with high confidence that in 2009, Mexican drug trafficking organizations (DTOs) were operating in the United States in at least 1,286 cities spanning all nine Organized Crime Drug Enforcement Task Force (OCDETF) regions, based on law enforcement reporting. Moreover, NDIC assesses with high confidence that Mexican DTOs in at least 143 of these U.S. cities were linked to a specific Mexican Cartel or DTO based in Mexico—the Sinaloa Cartel (at least 75 cities), the Gulf Cartel/Los Zetas (at least 37 cities), the Juárez Cartel (at least 33 cities), the Beltrán-Leyva DTO (at least 30 cities), La Familia Michoacán (at least 27 cities), or the Tijuana Cartel (at least 21 cities). NDIC assesses with high confidence that Mexican DTOs will further expand their drug trafficking operations in the United States in the near term, particularly in the New England, New York/New Jersey, Mid-Atlantic, and Florida/Caribbean Regions. NDIC also believes that Mexican DTOs will maintain the present high level of availability for heroin, marijuana, and methamphetamine because the conditions in Mexico and in the United States that enabled and motivated the DTOs to increase production and availability of those drugs have not significantly changed. Emails and documents related to the ongoing investigation of the Bureau of Alcohol, Tobacco, Firearms and Explosives’ “Fast and Furious”/Project Gun Runner program leaked to CBS. Includes a map of distribution routes for weapons involved in the program leading to locations throughout Mexico. Over the last few years, it has become more commonplace to see military-type weaponry such as grenades and assault rifles utilized by Mexican drug trafficking organizations (DTOs). Increasingly, many of the reported hand grenade seizures in United States are illegal, improvised grenades destined for Mexico and the DTOs. These devices have become a weapon of choice for Mexican DTOs because they are cheap, the components are relatively easy to obtain and manufacture, are easily concealable, and can kill or injure large numbers of people indiscriminately. 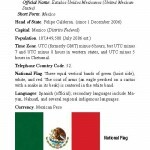 Reports have indicated that grenade attacks originated mostly in southern Mexico around the beginning of President Felipe Calderon’s presidency in 2006, and have steadily spread northward as the conflicts between rival DTO cartels, and Mexican government’s enforcement efforts have intensified in the northern Mexican Border States. CBP BorderStat drug seizure information was used to evaluate seizure statistics in relation to the arrest or death of key DTO personnel. The drug seizure data was collected from January 2009 through January 2010. This data was analyzed to determine if the arrest or death of key personnel had a direct impact on the flow of U.S.-bound drugs. This research indicates that there is no perceptible pattern that correlates either a decrease or increase in drug seizures due to the removal of key DTO personnel. Literally meaning “Party of God”, Hezbollah began as a militia in 1982 in response to the Israeli invasion of Lebanon. The Shi’a Islamist organization has since grown into a worldwide political and paramilitary network with seats in the Lebanese government, numerous social services programs, long-standing ties with the Syrian and Iranian governments, and an annual income estimated to be anywhere between $200-$400 million. Hezbollah’s main goal is to cast out any form of Israeli rule and/or occupation. Due to the U.S.’ political and financial support of Israel, Hezbollah regards our nation as a viable target. 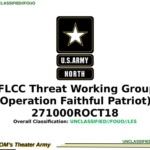 While there is no immediate or confirmed threat to the Tucson area, recent events and the current middleeastern political arena merit a renewed awareness of the group’s capabilities and presence throughout the Western Hemisphere. The San Diego Law Enforcement Center (SD-LECC) convened an analytical task force in Spring 2010 to address the question: “What does cross-border kidnapping in San Diego look like?” Intelligence Analysts from Chula Vista Police Department, San Diego Sheriff’s Department, the Federal Bureau of Investigation, and the Department of Homeland Security’s Office of Intelligence and Analysis analyzed statistical, investigative and open source intelligence from local law enforcement agencies, FBI, DHS, ICE, CBP, DEA and the U.S. Department of State Bureau of Consular Affairs to prepare this assessment. There is strong evidence—based on intelligence gathered from traditional and alternative sources, such as banks, hospitals, citizen interviews, wiretaps and private consulting firms—that kidnappings in the San Diego area are widely underreported. Consequently, this assessment offers a strategic baseline only; there is insufficient data to support a definitive study of cross-border kidnapping tactics and techniques. This assessment is intended to support law enforcement executives and practitioners in their efforts to collect additional information and combat this problem. The powerful confederation of Mexican DTOs known as the Sinaloa cartel controls the majority of Mexico’s marijuana and methamphetamine production and distribution, as well as cocaine trafficking from South and Central American producers into the United States across the U.S. southwest border. The Sinaloa cartel conducts business with powerful U.S. gangs that largely control local drug distribution. As one of the most powerful cartels operating in Mexico, it has expanded operations throughout western Mexico and attempted to take control of new plazas from weaker organizations. * Arrests of high-level members have not fractured the cartel or caused infighting—as was the case with several of its rivals—likely because of the cartel’s stable revenue sources, decentralized structure, family-based culture, and geographic breadth, which all contribute to its preeminence. This Homeland Security Assessment examines threats to U.S. border security emanating from the Mexican state of Sonora, which borders Arizona and a small section of New Mexico. It discusses drug and alien smuggling, border violence, and Mexican federal, state, and local government capabilities to confront organized crime. This is the fifth of six planned assessments on current threats to homeland security arising in Mexican states along the U.S. border. It is intended primarily for working-level analysts and operators engaging in homeland security-related activities and concerned with pertinent developments in Sonora and nearby U.S. territory. In Mexico, the violence generated by drug trafficking organizations (DTOs) in recent years has been, according to some, unprecedented. In 2006, Mexico’s newly elected President Felipe Calderón launched an aggressive campaign—an initiative that has defined his administration— against the DTOs that has been met with a violent response from the DTOs. Government enforcement efforts have had successes in removing some of the key leaders in all of the seven major DTOs. However, these efforts have led to violent succession struggles within the DTOs themselves. In July 2010, the Mexican government announced that more than 28,000 people had been killed in drug trafficking-related violence since December 2006, when President Calderón came to office. Postings of popular songs about drug traffickers are the most prevalent cartel-related content found in YouTube, the third most-visited social networking website in Mexico. Direct threats among cartels are less prevalent but hold a significant following, while videos honoring police killed in action register a low viewing record. Some sectors of Mexican society have also turned to the video-sharing site to express their anger at the violence brought by the ongoing drug war. (U//FOUO) Texas-Mexico Border Security Carnage Update, July 2010. Based on the areas in Mexico controlled by the Gulf, Zetas, and Sinaloa cartels; the locations of U.S.-sourced firearm recoveries in Mexico; and the U.S. locations where firearms recovered in Mexico are most often acquired, the Houston and Phoenix Field Divisions will be primarily responsible for investigating trafficking schemes associated with these cartels. However, this strategy is not intended to limit the initiative of any ATF field division and in fact recognizes the increasingly important role played by non-Southwest border field divisions in combating firearms and explosives trafficking to Mexico. As a result, all ATF field divisions are expected to initiate investigations on cartels and/or their surrogates operating in their geographic areas of responsibility; however, investigations pertaining to the Gulf, Zetas, and Sinaloa cartels must be deconflicted and closely coordinated with the Houston and Phoenix Field Divisions. FOUO Minnesota National Guard (MNNG) advisory to personnel with respect to travel to the United Mexican States (Mexico). 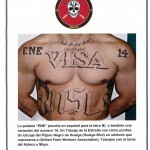 On May 8, 2010, a Spanish-language flyer was placed on a vehicle in Brownsville, Texas, warning that the upcoming weekend of May 15-17, 2010, would be one of the “most violent weekends in all of Mexican history” as members of an unidentified drug trafficking organization allegedly plan to battle an unspecified rival criminal organization. U.S.-Japan-EU-Mexico-Canada Confidential Anti-Counterfeiting Trade Agreement (ACTA) Draft Text, January 18, 2010. This is the 56-page full version of the “consolidated text” of the treaty. This booklet is published by the Texas Department of Public Safety, Criminal Intelligence Service, with the cooperation of the Texas Department of Criminal Justice-Security Threat Group Management Office. It is being provided as a resource to assist law enforcement agencies and correctional staff in identifying possible members of Security Threat Groups (STGs) and is not to be disseminated outside your agency. On September 22, 2009, National Defense University’s Strategic Policy Forum (SPF) conducted its twenty-eighth Congressional exercise, Deadly Venture, which explored the linkages and threats posed by the nexus between illicit narcotics trafficking and terrorism and the rising power and influence of Drug Trafficking Organizations (DTOs). The exercise scenario focused on the Latin America region and the U.S. – Mexico border.